With Ness, there was no silver lining. It was just awful, tragic, unfair. This tutorial's a bit all over the place (well, it feels like it to me) so I apologise for that, but I wanted to make sure Ness got a proper mention. It made me realise I need to have a look at a lot of different causes, too, and decide which ones I'll choose to openly promote through my nail art. In the last few years I have managed to get myself a wee bit of attention in cyberspace and it'd be a waste if I didn't use it wisely. 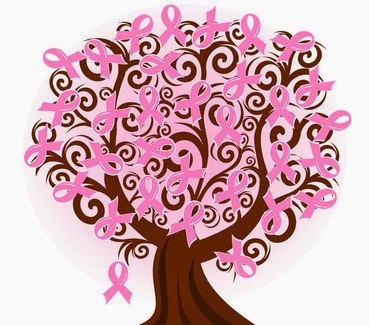 Breast cancer's an obvious one to do as it's so common and widely publicised, but I'd like to raise awareness for conditions that aren't as well-known - mental health will definite make it's way in there at some point, that's for sure. Anyway, here are the nails I did for today's tutorial. And here's the video for them. Please subscribe to my channel ♥. 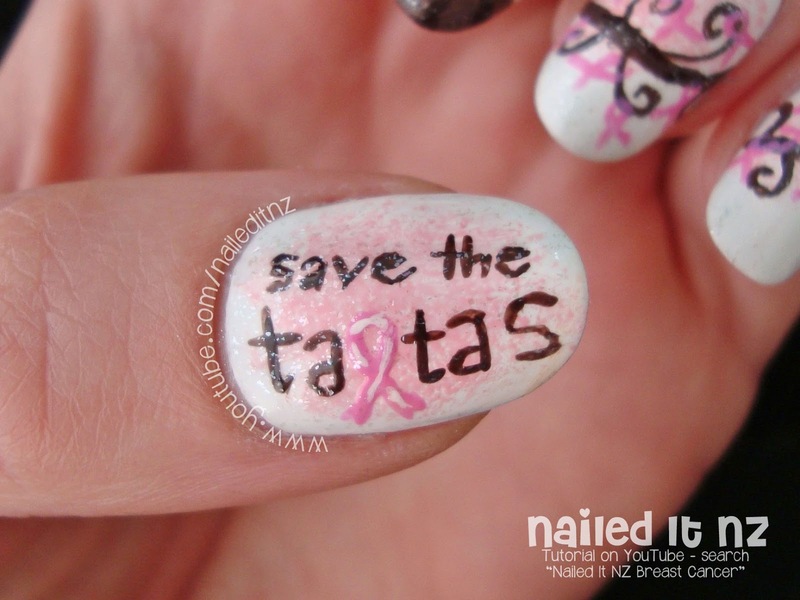 Here's a close-up of the thumb nail, with the phrase "Save the Tatas." It was inspired by this picture, which I found here. 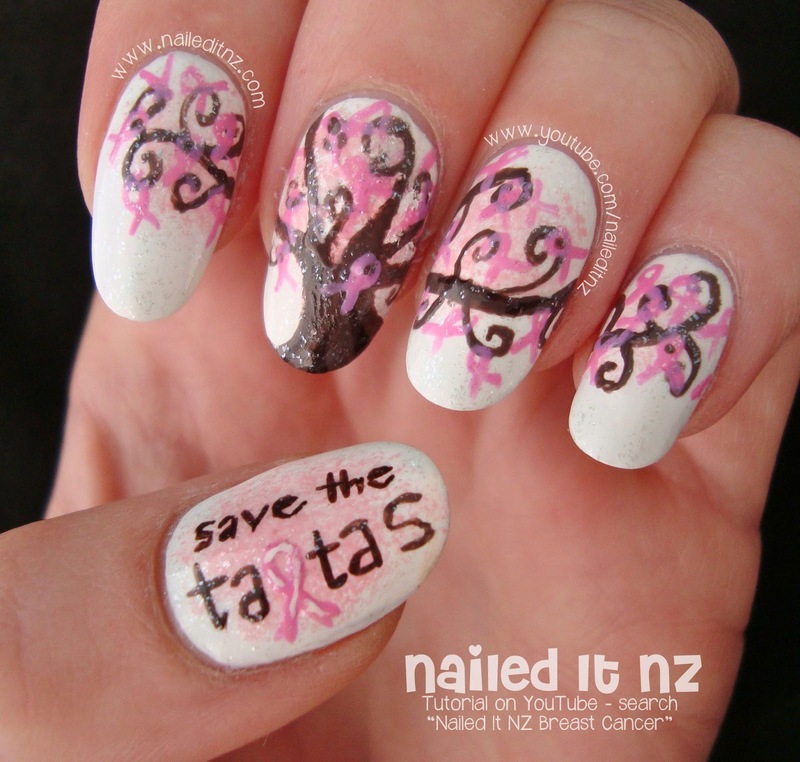 It wasn't hard finding inspiration for these nails - there are many beautiful, artistic works related to Breast Cancer! 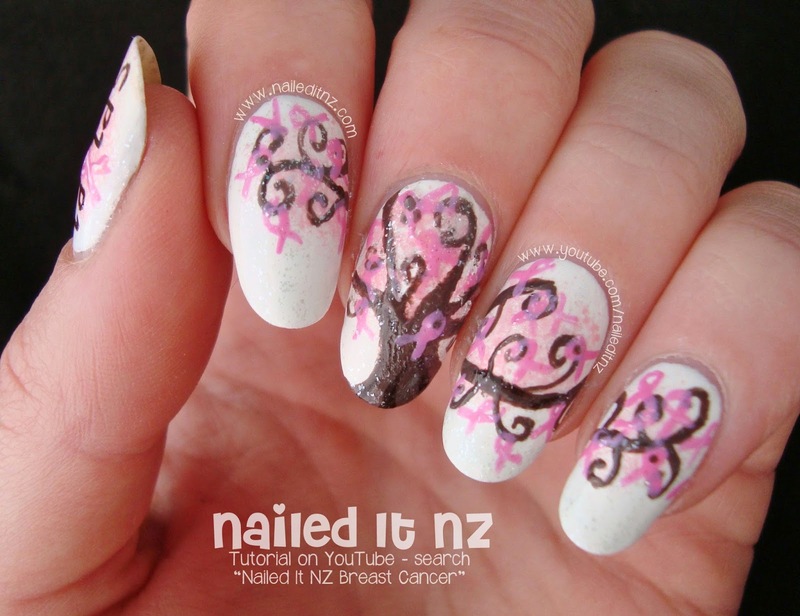 Here's the tree that inspired the rest of the nails, which I found here. I filmed this tutorial on a day that I was doing a big filming session - three videos in a row. On these days I'm pretty brutal with what I do - as long as I've got a photo I'm quite happy to wipe the slate clean within 5 minutes of completion. That was the plan for these ones, however I forgot to take a photo first!! Thankfully I had only done one wipe of the middle nail when I realised, and promptly freaked out and fixed it up. So if the middle nail looks slightly different in the photos than in the video, that's why ☺. I did Breast Cancer nail art last year as well - you can watch the tutorial for these here, and read the blog post about them here. I think I actually like last year's design better! 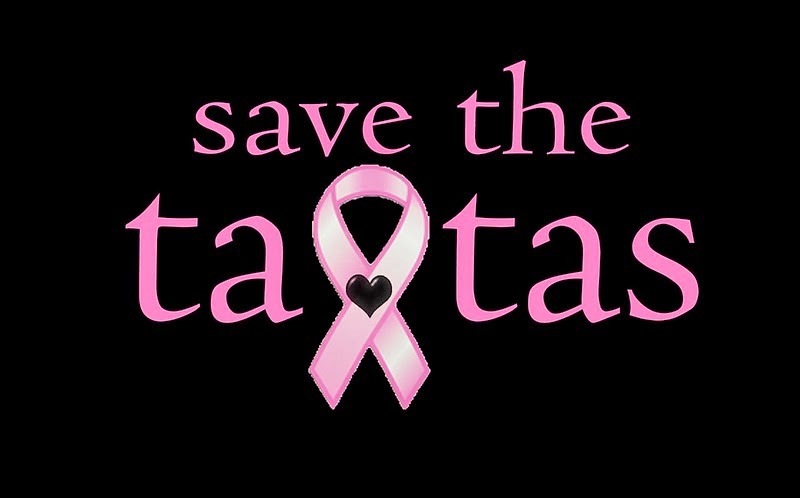 Here are some useful websites about Breast Cancer. The first two are New Zealand ones, but the third is an international one. I hope you like my latest Breast Cancer Awareness nails, and I hope you're having a happy, healthy day. 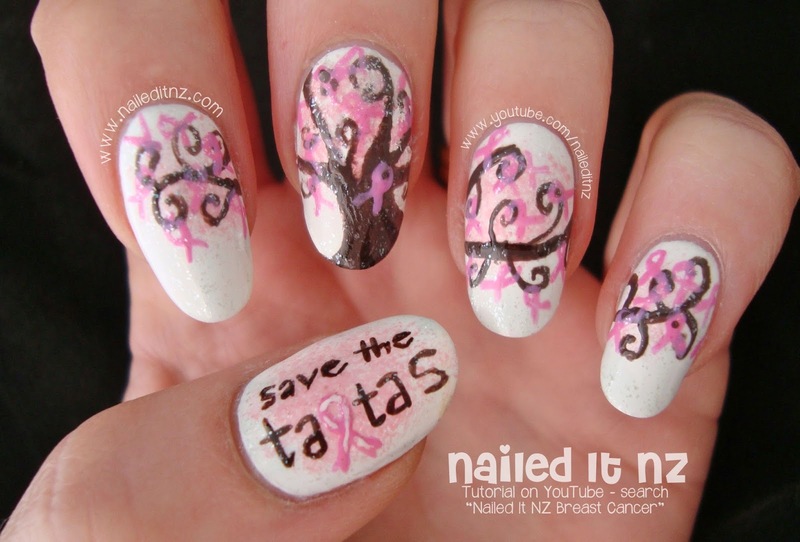 This is a lovely manicure to show support for breast cancer awareness. I really like your Breast Cancer Awareness nails and I think that it is very important for young woman to be aware about the seriousness of breast cancer! 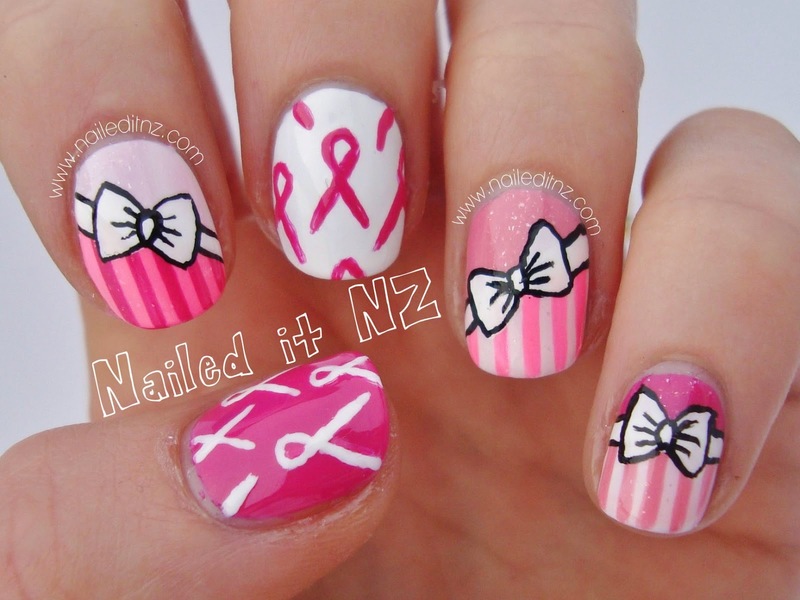 I like both Breast Cancer Awareness manicures, nice way to show your support!